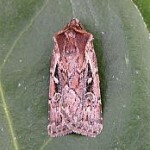 This page explains the different elements of the MothsIreland Atlas. Click on the atlas to bring you to explanation. Use your browser back button or click on “Atlas” to return. The atlases are based on the data in the MothsIreland dataset. It must be noted that this dataset is a work in continual progress Also it should be noted that generally moth recorders are few and far between. Therefore coverage is not complete. Click on the atlas to bring you to explanation. The numbers refer to checklist numbers. 73.342 is the number from “A checklist of the Lepidoptera of the British Isles” by Agassiz, D.J.L., Beavan, S.D. & Heckford R.J. 2013, often referred to as ABH number. ABH numbers have replaced the Bradley & Fletcher (bf 2107) coding system from (“A Recorder’s Log Book or Label List of British Butterflies and Moths” – J.D.Bradley and D.S. Fletcher (1979)). The English (vernacular) name is followed by the scientific name in brackets. Light trapping is by far the most widely used method for recording moths and results in some species, which are not strongly attracted to light, being relatively under-recorded. Immigrants are species which are resident outside of Ireland, usually in warmer climates in Southern Europe or North Africa. They fly, aided by suitable weather systems, to our shores. Some may well breed to produce locally bred offspring in the Autumn but these are very unlikely to survive the Winter. Common Locally Common in particular habitats or in restricted areas, e.g. sand dunes, Oak woodland. Scarce Not encountered as regularly or very restricted in range, e.g. the Burren. Extinct Previously resident but not recorded for many years. Common Immigrant Occurs countrywide most years. The dots mapped represent the 10km squares of the Irish Grid. All records have a grid reference, most to a resolution of 100m. There are 1019 10km grid squares in Ireland including off shore islands. The dark blue dot in a 10km square indicates that a species has been recorded in that 10km square since the 1st January 2000. There are many new moth recorders, practically all started since 2000. The light blue dot in a 10km square indicates that a species has been recorded in that 10km square only between 1st January 1970 and 31st December 1999. This period is “post Baynes”; (A revised Catalogue of Irish Macrolepidoptera E. S. A. Baynes (1964) post-Baynes; Supplement (1970)). Also 1970 is about the time Ken Bond commenced recording, so many of the light blue dots reflects Ken’s recording during this period. The blue open circle in a 10km square indicates that a species has been recorded in that 10km square only before 1st January 1970. There will not be many pre 1970 symbols on the map, because either the species has been recorded since in that 10km square, or relatively very few pre 1970 records have been entered. The number of 10km squares from which there is at least one record of this species in the database. This is out of a total of 1019 10k squares. The earliest date that the species has been recorded as an adult. This is in format MM-DD (MMM-DD YYYY) There are many errors due to incorrect stage, such as adult instead of caterpillar recorded in the database. Correcting these is ongoing. The latest date that the species has been recorded as an adult. This is in format MM-DD (MMM-DD YYYY) There are many errors due to incorrect stage, such as adult instead of caterpillar recorded in the database. Correcting these is ongoing. The year of last record of this species in the database. The date on which this map was captured. It will show all records entered into the MothsIreland database before this date. This is a bar chart based on adult records. Each bar represents a week. The text gives the highest weekly total of records. This bar chart is a good indicator of flight time. It must be noted, that since records are from a geographically large area, flights times may vary between regions and it is most heavily influenced by areas from where there are more records. 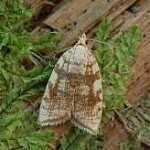 Butterflies and Moths of Northern Ireland website.